Sprinter Adam Peaty claims a shock 200m breaststroke victory on the opening night of the British Swimming Championships in London. 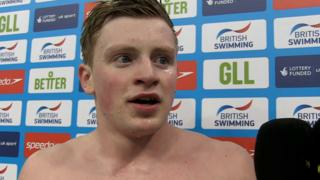 Peaty, 20, won European and Commonwealth 100m breaststroke titles and set a 50m world record in breaststroke events during 2014, and his time of two minutes 8.34 beat Andrew Willis and pre-race favourite Ross Murdoch into second and third respectively. Olympic silver medallist Michael Jamieson was sixth, and says his "over-the-top" reaction to a disappointing 2014, which resulted in him taking a break away from the pool, means he is not in the condition to swim competitive times this year.